The first life work I've done in ages - sometimes it doesnt hurt to have a bit of a break though as long as some kind of artwork is being done. This was the regular monthly Modelled Me workshop and it was good to be back and good to have Martin the diver as our model. He was suffering a bit of a bad back but it still managed a sterling job. 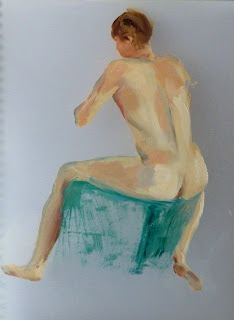 After a few five minute warm ups the long pose, about 90mins. Unfinished due to rust (mine not his), unmixed paints and generally not quite back in the swing. Not my favourite kind of pose either. Second shorter pose, much better. Oil on film. Totally rejiggered at home - it reads better now and playing afterwards like this focusses the mind on good information gathering for next time. Charcoal pencil on paper A3 - Is that arm too long...mmmm?